What was the point of this? – HEY, IT'S PAT RYAN'S BLOG! The photo caught my attention when I read the story in Friday’s Houston Chronicle—as it was meant to. Now, I get it that when you run a story about some people, you want some art. 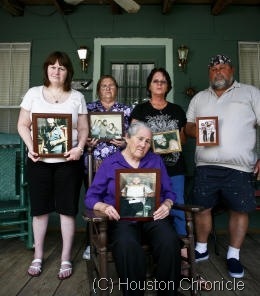 But do you ask these people each to hold a photo of their murdered relative? What, like they all carry that around with them all the time? Read the story, and what do we have: a man disappears, no trace; his family searches and hopes he’ll be found, but authorities identify a body as that of the missing man, who was the victim of a homicide. The story is at the top of the local news section, and so I’m looking for the news. It’s not that a man disappeared—that happened in 1988. It’s not that a body was found—that happened in 1989; and although the body was found only a few miles from where the man was last seen, the news does not seem to be that authorities couldn’t put two and two together, either. The news isn’t that the body was just identified—that happened three months ago. And the news is not that the killer has been found—no one’s been arrested; heck, the cops have no suspects.